Since a walk-in cooler or freezer is one of the most important and expensive pieces of equipment you can invest in for your restaurant, it’s wise to do a little research before you order one. Buying a unit that does not meet your needs can be a costly mistake. With the right walk-in, you’ll have a place to store all the perishable foods your restaurant needs, keeping your kitchen well stocked. Among the first decisions you will have to make is whether to buy indoor or outdoor walk-in refrigeration. While either will keep your food at a safe temperature, they each have their own benefits, drawbacks, and requirements that may make one or the other a better fit for your operation. The primary advantage of selecting an outdoor walk-in refrigerator or walk-in freezer is that you’ll preserve precious space on the inside of your building. If you’re in the market for a ready-to-ship unit, one that has been pre-designed with standard size panels at the factory and is ready to order without custom specs, delivery and installation can be quick as long as you have good level ground to put it on. Otherwise you may need to have a new concrete slab poured for it. You might choose a ready-to-ship model if you need one in a hurry or would rather not get involved in a lengthy installation process. They're often significantly less expensive than custom models as well. Another advantage of an outdoor walk-in is the location of the condenser. Refrigeration systems work by removing hot air from inside the cooler or freezer and blowing it outside the unit. On an outdoor walk-in, the hot air goes directly outside. On an indoor unit, the condenser either emits warm air into the building or requires the installation of a remote condensing unit, which involves running refrigeration lines through the building to the roof or an exterior wall. With an outdoor unit, this hassle can be avoided. If you don’t want your employees to have to walk through the elements to get to an outdoor unit, you’ll need to cut a new doorway in one of your exterior walls. This can be quite the renovation project, and you must make sure the wall is one that can be safely modified and that the opening is sealed up sufficiently. If it is a load-bearing wall, this may be costly or impossible. To avoid common maintenance nightmares, make sure you don’t leave the door open for extended periods of time or frequently enter and exit the unit unnecessarily. Keeping the door closed will save money on the electric bill and it will keep your refrigeration system from working harder than it needs to. An overworked system can cause a mechanical failure when an excessive amount of ice forms on the coil. Outdoor units also tend to sweat, which can cause a hazard if ice develops on the floor of the unit. Sweating is worse when you leave the door open. Finally, you may have to spend more to properly outfit your outdoor unit. The need for additional components depends mainly on your neighborhood and local climate. Some type of roofing is a necessity. If heavy snow is expected, make sure the roof cap is strong enough to handle it. Flat roofs do not to hold up to heavy snow loads and may be illegal to put on top of your walk-in in some locations because of those conditions. If your business is in an area where tropical storms occur, hurricane tie-downs may be required. If you live in an exceptionally hot or humid environment, special measures may need to be taken to protect your unit from the heat. Consider installing a shade canopy over your unit to protect it from the sun. This will help keep internal temperatures down and avoid overworking the condensing unit, which could lead to costly breakdowns. Some choose to install two condensers that work together to share the burden of cooling in hot weather. An additional unit can also give you peace of mind knowing your food will be safe if one of the units breaks down. Many local governments require fencing or similar coverings around walk-ins for looks. Other accessories may be required if you’re in a high-crime area. Fences, gates, lockable shelves, and locking door reinforcement bars can keep contents and the condenser safe from thieves. Between creating an opening in the wall, higher initial costs, and the need for accessories, an outdoor unit may end up costing quite a bit more than a similar-sized interior model. However, if your restaurant cannot give up the space required for an interior unit, then the added expense is worth it. For many people, an indoor walk-in makes the most sense. The most obvious advantage is that an indoor unit is easy to get to. Instead of walking outside the building to retrieve your cold food, you’ll have it nearby when you need it. This is especially important if your walk-in is your primary means of refrigeration and you need to access it frequently. An indoor walk-in cooler or walk-in freezer can cost less than an outdoor unit in terms of up-front cost, installation, operation, and maintenance. Indoor units don’t require all of the accessories like fences, roof caps, and anti-theft equipment that the outdoor units do. Additionally, the cost of maintenance due to weathering is eliminated with an indoor unit. An indoor unit can also cost less to run. When the weather gets hot outside, the outdoor unit will have to work harder to maintain temperatures. An indoor unit with a remote condenser, one that is mounted somewhere on the outside of your building, is the most affordable to operate. Self-contained units will emit hot air inside your building, which can increase the cost of air-conditioning and make conditions uncomfortable for your employees. Compressors are noisy machines, so be mindful of this if you’ll be installing your walk-in refrigerator within earshot of your customers or in a place where noise will be an issue. Another reason to go with an indoor unit is that you won’t have a giant metal box attached to the side of the building, helping to maintain the curb appeal of your business. Some local governments require outdoor units to be concealed by a fence, which can also add to the cost. That’s not to say an indoor walk-in refrigerator is for everyone. An indoor model will take up valuable interior space. Before going this route, you need to ask yourself if you have enough space to sacrifice. This is especially true if your restaurant is looking to add a second walk-in when you’ve already dedicated some space to your first. Even though installation usually costs less for interior walk-in refrigeration, this is not always true. Large units can weigh over a ton, not including the hundreds of pounds of food, kegs, or containers you’ll be storing in it. The floor in the area where you’re putting the walk-in may have to be reinforced to avoid stress and cracking. If your floors are made of wood, they will require a protective barrier to prevent moisture from decaying the wood over time. When choosing the best walk-in for your restaurant, there are some decisions you have to make no matter which type you go with. One deciding factor is how much cold storage you’ll need. Many sizes are available from smaller four-by-five feet “step-in” boxes to custom-built models that are as big as you need. One thing to keep in mind when looking at walk-in dimensions is that they measure the exterior, not the interior. The length and width of the interior will be slightly less than that of the exterior. Shelf layout will play a large part in determining how much space you’ll have to store your food items. Keep in mind that you will need about 40 inches of aisle space if you want to be able to bring a cart inside. From that aisle space, you can determine how long and wide your shelves can be in order to maximize the amount of storage available. It’s wise to plan walk-in refrigeration from the inside out, determine how much space you want inside, including your ideal aisle width and shelving size, then choose a walk-in that has the external dimensions to accommodate those factors. Another decision is what insulation you want for your new equipment. The two methods of insulation are foamed-in-place and laminate. Foamed-in-place is where two plates are bolted together and insulation is pumped between the plates where it expands, creating a densely packed shield against heat transfer. Laminate models have their insulation attached by a hot epoxy set. Laminate is better for custom-sized walk-ins because it can be cut to the exact size you need. If you’re buying a walk-in from a well-known manufacturer, there is little performance difference between the two. Foamed-in-place insulation is preferred in hotter climates because laminate can pull away from the foam under hot and humid conditions. With the exception of ready-to-ship models, most walk-in coolers and freezers come unassembled. It is suggested that you hire a professional to help with the installation, but many can be assembled by anyone with enough patience and dedication. Unless you purchase a model with pre-charged, quick-connect refrigeration or one with a self-contained condenser, you will also need to have a refrigeration contractor to set up the refrigeration system and charge the lines with refrigerant. Refrigeration systems are either remote or self-contained. Remote condensing models are split-systems with an outside condensing unit that works similar to the central air conditioning unit that sits outside your home. These can be placed on the roof of the walk-in, the roof of your building, or next to your building on a platform. That flexibility of location can help you effectively manage the heat and noise generated by a walk-in refrigerator or walk-in freezer. Self-contained units are attached directly to the cooler or freezer box and offer little, if any, flexibility in where you locate the condensing unit. An unassembled remote model is the least expensive type, but they require the most labor-intensive installation. They come as a box of parts and usually require assembly by a refrigeration professional. Once assembled, you’ll have to have an expert fill the refrigerant lines with fluid to get the unit up and running. Remote condensers, because they are located outside, need to be fitted with protective weather housing and winter controls to keep them from freezing in the winter. This can add to the cost, but remote units generally provide better energy efficiency. Even if you choose a preassembled model, you’ll still need to schedule a visit from a refrigeration specialist unless you get one with pre-charged lines, which already have refrigerant installed and can be assembled by anyone with enough attention to detail. If you want a remote refrigeration system but do not want to hire a refrigeration specialist to do the installation, a preassembled unit with pre-charged lines is your best bet. Remember, even though assembly may be simple enough, many of the components – especially the condensing unit – can be extremely heavy. Depending on the size and location of the unit, you will likely need special equipment to lift components into place. The last type of refrigeration system is self-contained. These need little assembly as most of the system comes pre-packaged from the factory. The condensing unit will still need to be mounted to the outside of the box, either on the top or side. Typically, self-contained models are the most expensive of the three refrigeration types, but they require the least effort to install. These work very well for outdoor walk-ins, but indoors they can increase your cooling costs and add noise. Flooring is another important consideration when it comes to installing a walk-in. A walk-in cooler or walk-in freezer can be purchased with or without built-in flooring. Built-in floors are ideal, because they’re insulated and will provide better energy-efficiency. Outdoor models usually have floors because the concrete slab they rest on can absorb heat from the sun, making them harder to cool. Walk-in refrigeration without built-in floors are usually installed with rubber or foam screeds along the bottom of their walls to keep them in place and seal in cold air. Unless your walk-in is installed on a recessed floor, a ramp will be required to let you roll carts into the unit. Ramps are virtually always required outdoors. There are multiple flooring surfaces to choose from than can make it safer inside your walk-in. Diamond tread plates are an option to create a non-skid surface inside the unit. These protect employees from slipping in case there are spills or water on the floor. Rubber surfaces are also available that have the same benefits, and both types are available to cover the entire floor or in individual strips to be placed in the aisle where they're most effective. A variety of different doors are available. Models with cam-lift hinges allow the door to automatically close, so they won’t be accidentally left open. For indoor walk-in refrigeration, strip doors are available to help keep in cold air while allowing employees to enter the walk-in with door open. Both are good options if people will be entering and exiting the cooler or freezer frequently. Door windows are another option to consider. These can allow you to see the contents of your walk-in from the outside and can bring more light into the unit. The most common exterior finish for a walk-in is stucco-embossed galvanized steel. Other types are available ranging from smooth stainless steel to colors like black, white, and beige. These finishes are valued in settings where walk-ins are visible to the public. Many non-essential options are available with a walk-in cooler that can help protect your investment and avoid some of the common problems that are encountered. Because a walk-in can take a lot of abuse when carts and heavy items are moved in and out, kick plates and bumpers are available to absorb and deflect some of the inevitable impacts your unit will encounter. These can help prevent dents and punctures to the walls and extend the life of your walk-in. Other accessories to protect your investment include alarm systems that alert you when temperatures go outside the expected range, allowing you to address problems before they lead to spoiled food. These can be set to send you a phone call or text message when a problem is detected, allowing you to take action even if you're not on site. Similarly, door alarms are available that warn you when the walk-in’s door has been left open. Exterior thermometers let you monitor temperatures from the outside of the walk-in refrigerator and fluorescent lighting can save on energy costs and provide brighter light over incandescent bulbs. 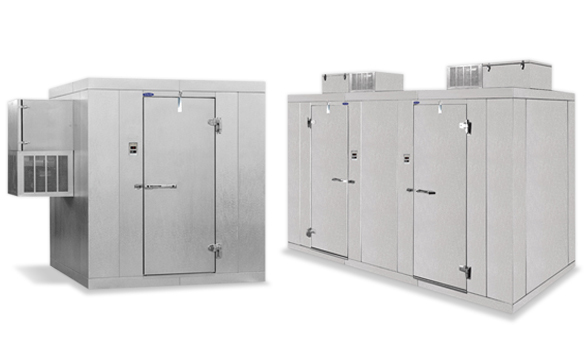 Walk-in units are designed for storing foods that are already at food-safe temperatures. If you plan on frequently adding a lot of warm or room-temperature products, your walk-in cooler or walk-in freezer may have a hard time bringing contents down to safe temperatures fast enough. The same concern is true for large, dense items like beer kegs. Consult a Customer Service rep to understand your options if you plan on storing these types of items. Obviously, walk-ins are designed to stay put where you install them, but there are portable options available that let you take some of the benefits of a walk-in on the road with you. Great for catered events and banquets, they consist of a collapsible frame with a detachable, zippered bag that serves as the storage box. The refrigeration unit is mounted on casters for easy transportation between venues.